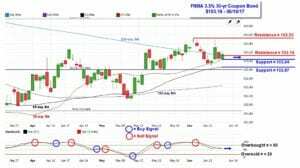 The stock market ended the week in “mixed” fashion with the NASDAQ Composite Index underperforming as investors locked in some profits in high-flying large-cap technology stocks. Selling was particularly noticeable in the so-called FAANG stocks – Facebook, Amazon, Apple, Netflix, and Google (Alphabet) that represent $2.36 trillion in market capitalization. Meanwhile, the Dow Jones Industrial Average traded to another new all-time high during the week. Bond prices moved modestly higher with yields pulling back following the Federal Reserve’s widely expected decision to raise the fed funds target range by 25 basis points to 1.00%-1.25% and on weaker economic data and relatively tame inflation news. Inflation, as measured by the consumer price index was weaker than expected as were retail sales and housing starts and permits. There were several housing reports released during the week including weekly mortgage data. Mortgage application volume increased during the week ending June 9. The Mortgage Bankers Association (MBA) reported their overall seasonally adjusted Market Composite Index (application volume) rose 2.8%. The seasonally adjusted Purchase Index decreased 3.0% from the prior week while the Refinance Index increased 9.0%. Overall, the refinance portion of mortgage activity increased to 45.5% total applications from 42.1% in the prior week. The adjustable-rate mortgage share of activity was unchanged at 7/4% of total applications with the average loan size for refinance applications reaching their highest level since September 2016 at $274,700. According to the MBA, the average contract interest rate for 30-year fixed rate mortgages with a conforming loan balance fell to 4.13% from 4.14% with points increasing to 0.35 from 0.34. 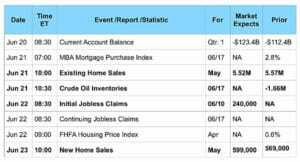 Moreover, Housing Starts and Building Permits for the month of May were both reported below their consensus forecasts. 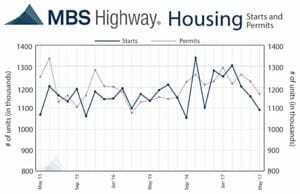 Housing Starts in May fell 5.5% to a seasonally adjusted annual rate of 1.092 million from a downwardly revised 1.156 million in April and were below the consensus forecast of 1.227 million. The decline in Housing Starts was led by a 9.8% drop in multi-unit housing while single-family unit starts fell 3.9%. On a year-over-year basis, Starts were 2.4% lower. Building permits didn’t fare much better, declining 4.9% month-over-month to a seasonally adjusted annual rate of 1.168 million versus a consensus forecast of 1.250 million. Permits for single-family units declined 1.9% as compared to April. Overall, the decline in single-family permits suggests housing supply shortages and affordability concerns are likely to continue within the new home market. For the week, the FNMA 3.5% coupon bond gained 10.9 basis points to close at $103.156. The 10-year Treasury yield decreased 4/92 basis points to end at 2.153%. Stocks ended the week “mixed”. The Dow Jones Industrial Average gained 112.31 points to end at 21,384.28. The NASDAQ Composite Index fell 56.16 points to close at 6,151,76 and the S&P 500 Index added 1.38 points to close at 2,433.15. Year to date on a total return basis, the Dow Jones Industrial Average has gained 8.21%, the NASDAQ Composite Index has advanced 14.28%, and the S&P 500 Index has risen 8.68%. The past week, the national average 30-year mortgage rate fell to 4.00% from 4.01%; the 15-year mortgage rate was unchanged at 3.26%; the 5/1 ARM mortgage rate rose to 3.08% from 3.05%; and the FHA 30-year rate fell to 3.70% from 3.75%. Jumbo 30-year rates decreased to 4/28% from 4.29%. The FNMA 30-year 3.5% coupon bond ($103.16, +11 bp) traded within a wider 61 basis point range between a weekly intraday low of $102.89 on Tuesday and a weekly intraday high of $103.50 on Wednesday before closing the week higher at $103.16. The chart shows the bond range-bound between support and resistance levels with the slow stochastic oscillator neither overbought nor oversold suggesting the bond could trade in a sideways direction with mortgage rates remaining relatively stable near current levels for the coming week.